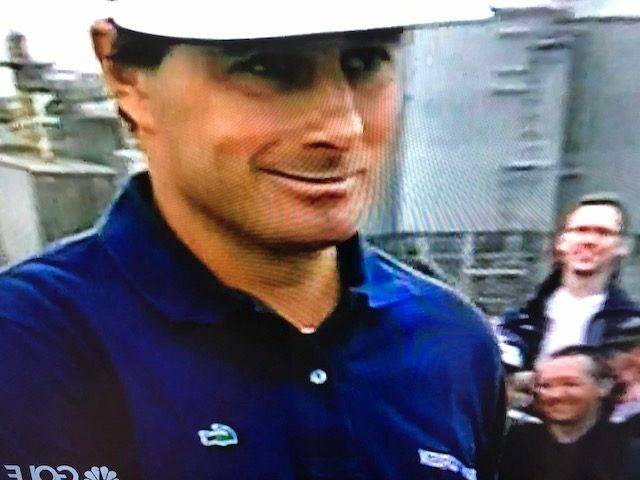 The smirk after getting away with the tee shot on 18. 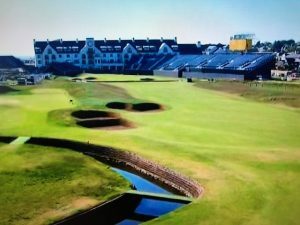 Next week, the Open Championship returns to Carnouiste where it’s best to describe golf as just plain “hard.” It is also the 20th anniversary of the 1999 event where Jean Van de Velde surrendered a three shot lead on the 72nd hole of the tournament. This was indeed a cataclysmic disaster and tragedy for Van de Velde with the gods of golf in full participation. A combination of factors accounted for this demise with Van de Velde as the responsible protagonist aggravated by a series of horrible decisions and the impacts of those decisions that sealed his fate. Van de Velde arrived at the 18th hole at Carnouiste late on Sunday with a three shot lead over Justin Leonard and Paul Lawrie at (+6). It was sprinkling and misty which added to the drama that would unfold in what seemed like forever as he teed it up with Craig Parry who was no longer in contention. The 18th hole is fraught with danger with a burn on both sides of the hole and rolling up to the green to the 50 yard mark. Van de Velde was feeling good as he approached the 18th tee and television commentators Curtis Strange, on course reporter Bob Rosburg and Mike Tirico were all saying that Van de Velde needed to leave the driver in his bag, pull an iron and hit it in the middle of the fairway. Just as they were making these points, Van de Velde pulled the driver out of the bag without any hesitation whatsoever. Strange and Rosburg groaned and couldn’t believe it. He only needed to make a 6–put the ball in the fairway, hit another one in the fairway, chip it on the green and two putts for the Claret Jug and immortality. Van de Velde had two pars and a birdie on this hole in all the prior rounds but on those days, the wind was “with” and now the wind was “against.” He swung and the ball flew and the crowd groaned….the ball flew the burn on the right into the 17th fairway but was in good shape and most importantly “dry.” The commentators were hopeful that Van de Valle would come to his senses, be appreciative of his good luck and hit a 5 iron to the middle of the fairway. However, Van de Velde had other ideas. He took dead aim at the green. It really wasn’t a bad idea–he should be able to easily clear the burn, avoid out-of-bounds on the left and if it went into the bunker–so what! What happened next was so improbable, unfair, unlucky despicable etc. etc.–the ball cleared the burn but veered to the right and hit a bump on the grandstand…okay the ball could drop there and he would receive a free drop away from the stands–even if the ball went into the stands–he would get the free drop. What occurred was mind-blowing! The ball ricocheted off the grandstand and went backwards instead of forward heading for the burn–it hits the stonework on the top of the burn, bounces high in the air and lands into the rough about 60 yards from the green. The rough is at least knee high and wet. It was the worst break imaginable. This is where things really get out of control as the game speeds up, you can’t believe that this has happened and your mind is having trouble processing what has to be done next. He would either have to go for the green over the burn and carry about 35 yards or chip out sideways for the next shot which would be easier. The problem was that each shot had equal risks due to the length and wetness of the rough. Van de Velde thought it about for a while while the crowd went crazy–the drama was incredible as the weight of bad luck had to penetrate his mind effecting his ability to execute shot no. 3. He decided to carry the burn but it was not to be–the wet rough caught the club and ball plopped into the burn–the crowd went crazy with horror as you could feel that the championship was beginning to ebb away. Van de Veldt looked down at the ball in the burn and spent quite a bit of time thinking about hitting out of the burn. 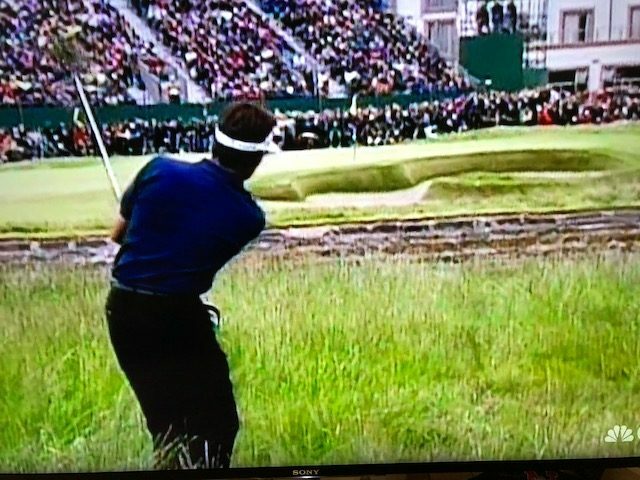 He took off his shoes and socks and meandered down into the burn but the ball was so close to the wall of the burn that it would be almost an impossible shot to pull off and potentially he might have hit out of bounds over the green. He got dressed again and decided to take the drop, he was now laying 4 and now would have to get up and down to claim victory. The commentators response was easy–it was impossible. The next shot found the bunker to the right of the green just in back of where Craig Parry’s ball lay. Craig was there in 2 and what made matters worse was that Van de Velde was away and would have to hit first. In a great display of sportsmanship, Parry offered to hit his shot first out of the bunker to get out of the way since he couldn’t win. Van de Velde thanked and Parry stepped up to his ball and holed the bunker shot for a birdie 3. Van de Velde would need to do the same to claim the championship–it wasn’t to be and the ball landed about six feet from the hole. Van de Velde would now need to hole the putt to get into a playoff with Lawrie and Leonard and this was no simple putt. 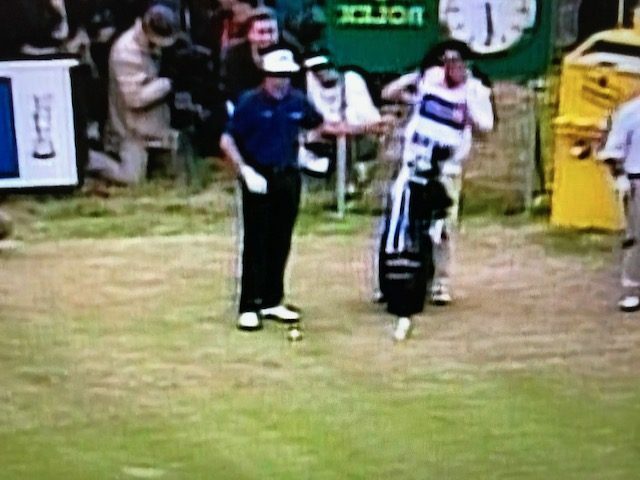 Most players would even come close to making this putt under the circumstances–Recall Tom Watson’s four foot putt at Turnberry to win an Open at age 60 that wasn’t even close after the bad break he got with his approach shot on the 72nd hole at Turnberry. Van de Velde holed the putt and clenched his fist as if he had won the tournament for a 7. Everyone was drained after this ordeal and the four hole playoff was a mini disaster as no player could grab a lead. Finally Paul Lawrie hit a tremendous 5 iron on the 18th hole to 3 feet and walked off with the Claret Jug. Lawrie had shot 67 on the final day and was 10 shots behind the leader (Van de Velde) but this would be his day and he earned the victory with his great play on Sunday. Paul Lawrie played extremely well and won this championship but he needed some help from the gods of golf and some decision-making by Van de Velde that would be second guessed for eternity. Why select a driver on a treacherous 18th hole with a 3 shot lead? Why go for the green after the tee shot miraculously crossed the burn on the right side of the fairway? Why go for the green from knee-high rough which had punished the players all week? Van de Velde had good answers for all of these decisions but he tempted fate with second shot and the gods of golf reacted by providing the worst break in the history of a major championship. The chances that the ball would hit the grandstand and bounce backward, hit the stone on top of the burn and clatter into the rough have to be pretty long. Van de Velde gained more notoriety in his failure than Lawrie gained with the Championship but Lawrie’s name will be on the Claret Jug forever. Van de Velde handled his fate with class accepting full responsibility for the outcome. Many of the pundits wanted to blame his caddy for not talking him out of some of his decisions. One commentator stated that the caddy should have broken the driver in two so Van de Velde would be unable to choose it at the 18th hole. Unlike last year when I predicted that Jordan Speith would win the Open Championship, there is no way in my mind to predict a winner at Carnoustie. The course is just too hard and if the weather plays a role this upcoming week, anyone can win and I wouldn’t be surprised if the winner was the 2019 version of Paul Lawrie (relatively unknown in 1999 but a fine player). We can all just hope that the gods of golf will take this week and maybe the R&A will move the grandstand on 18 (probably not).